The following excerpts from a letter received by Mr. P. W. Hancock, Elgin Street, Lindsay, from Sgt. 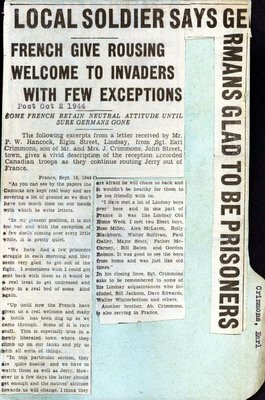 Earl Crimmons, son of Mr. and Mrs. J. Crimmons, John Street, town, gives a vivid description of the reception accorded Canadian troops as they continue routing Jerry out of France. As you can see by the papers the Canucks are kept real busy and are covering a lot of ground so we don’t have too much time on our hands with which to write letters. In my present position, it is not too bad and with the exception of a few shells coming over every little while, it is pretty quiet. We have had a few prisoners straggle in each morning and they seem very glad to get out of the fight. I sometimes wish I could get sent back with them as it would be a real treat to get undressed and sleep in a real bed of some kind again. Up until now the French have given us a real welcome and many a bottle has been dug up as we came through. Some of it is rare stuff. This is especially true in a newly liberated town where they climb up on our tanks and ply us with all sorts of things. In this particular section, they are quite hostile and we have to watch them as well as Jerry. However in a few days the latter should get enough and the natives’ attitude towards us will change. I think they are afraid he will chase us back and it wouldn’t be healthy for them to be too friendly with us. I have met a lot of Lindsay boys over here and in one part of France it was like Lindsay Old Home Week. I met two Ebert boys, Ross Miller, Alex McLaren, Rolly Blackburn, Walter Sullivan, Paul Galley, Major Scott, Father McCarney, Bill Baten, and Gordon Robson. It was good to see the boys from home and was just like old times. In his closing lines, Sgt. Crimmons asks to be remembered to some of his Lindsay acquaintances who included Bill Jackson, Dave Edwards, Walter Winterbottom and others. Another brother, Ab. Crimmons, is also serving in France.